Today, 28 February 2014, marks the end of a five-day introductory workshop in bioinformatics and genomics. The hosting of the workshop at the ILRI campus in Nairobi was a collaboration between the BecA-ILRI Hub, the National Science Foundation, the Fulbright Foundation, and Reed and Lewis & Clark Colleges. Workshop facilitator Sarah Schaack is an Assistant Professor of Biology, Reed College, USA currently on sabbatical at the BecA-ILRI Hub. The course attended by 34 participants from Ethiopia, Kenya, Rwanda and Uganda introduced participants to basic concepts and tools in bioinformatics and genomics through a combination of lectures, hands-on demonstrations and discussions. I addition to introducing fundamental challenges in DNA sequence analysis, the workshop highlighted research methods and best practices including developing hypotheses, identifying appropriate controls and ensuring reproducibility. To ensure that participants can apply the newly acquired skills beyond the workshop, all programs, data and papers that were used were derived from freely accessible resources including public databases, free software and public access scientific literature. Schaack is among the scientists from leading international research institutions who complement the core BecA-ILRI Hub staff. These experts enable a broader and deeper range of research and capacity strengthening programmes to be conducted at the BecA–ILRI Hub and a larger number of younger African scientists to be mentored in their research by more experienced scientists. 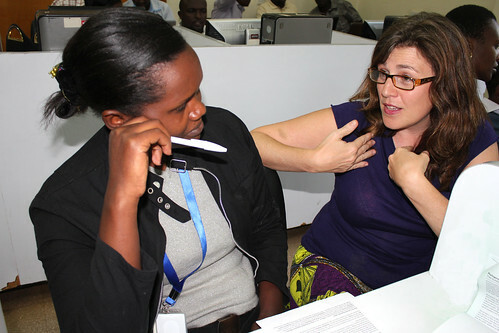 Schaack first visited the BecA-ILRI Hub in 2011 to facilitate an inaugural set of bioinformatics and genomics workshops she had developed to introduce researchers to DNA sequence analysis. In October 2013, Schaack returned to the BecA-ILRI Hub on a sabbatical. Her time at the BecA-ILRI Hub has enabled the formation of collaborations and partnerships with other organizations in the region. “BecA is a fantastic host institution and my experience here has exceeded any hopes I might have had. To other scientists, I can only say, you don’t want to miss out! There is so much to learn and so many ways to engage here, I can't wait for my next sabbatical!” said Schaack. indeed,Sarah is not just a teacher..she is such a great friend! !having attended one of her courses...thats all i can say.